Today is my turn in the Moda blog hop and I'm pretty excited. As the theme for the blog hop is Hometown Buzz, I get to tell y'all about where I live, Austin, Texas. I really love my town and I do happen to think it is one of the best places to live, certainly in Texas, and probably in the US. So, I won't have any problem extolling its virtues. I'm also psyched to share a free PDF block pattern and giveaway fabric. Because, who doesn't love that? Rather than write you an essay about Austin, complete with topic sentence and three supporting paragraphs, as well as a well-stated conclusion (can you tell I have a kid in school? ), I thought I would make a list of 5 of my most favorite things about Austin. 5. Until his sad and untimely death recently, Leslie Cochran, usually known as just Leslie, ran for mayor of my fine town, always campaigning in outfits that featured his trademark leopard print thong. 4. Having an amazing trail that winds its way around the Colorado River right in the middle of town. Last Saturday's buzz on the Town Lake trail: Did you see Lance (Armstrong) running on the trail? 3. More Tex-Mex restaurants than Starbucks. That's really what you want on every corner. 2. Live music, baby! Can you say Austin City Limits music festival AND South by Southwest? And that doesn't even count all the minor music festivals like the Keep Austin Weird Music Fesitval. Hello! QuiltCon is here in February of 2013. How cool is that? 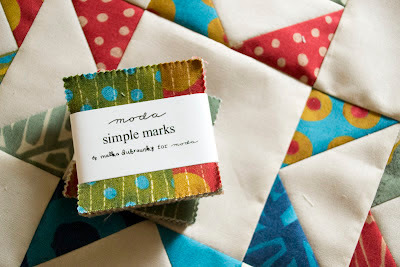 Another reason I'm excited to be a part of the blog hop is that it gives me an opportunity to tell and show you a bit about my new line, Simple Marks. To celebrate the hop, new fabrics, both mine and by the other talented designers at Moda, and just cause, the terrific folks at Moda are offering up this simple, yet contemporary block pattern for you to make. Click here to get the PDF of the instructions for the Sew Sweet Sampler. I'm working on a mini quilt with four of these blocks and my mind is already planning how I'm going to supersize it. I've got a charm pack to give away as well as two, 2 1/2" charm packlets(that is what you call teeny charm packs, right?). So, I'm going to pick two winners, one for the 5" charm squares and a second for the pair of 2 1/2" charm squares. Now, it's your turn, leave a comment and I'll announce the winner in a few days. I hope that guy (we'll call him, "Thong Man") didn't get in as mayor! Holy cow! I can't wait to visit Austin in February. Simple Marks looks like a fun new fabric line. Thanks for the chance to win. I could go for some Tex-Mex right now, it is lunch time. I really like your fabric too. I had to laugh at the mayoral candidate--too funny! We have our own guy like that in town, though he doesn't run for mayor. He does have a FB page dedicated to him, his business-in-the-front, party-in-the-back mullet, and the yellow rain coat he wears no matter what the weather. Tex Mex at every corner? I am insanely jealous. It's been 2 years since I've been back in the US, which means it's been 2 years since I've had proper Mexican food. Oh, how that kills me. Love your new line...I made 2 quilts this summer with your A stitch in color line. They were vibrant! Visited Austin last year, had ribs at The County Line - oh so yummy, and watched the bats fly out from under the bridge. Such a fun town to visit! I'm hoping to move to Austin when I retire, or maybe Fredericksburg. Your new line looks great and I hope I am one of the lucky winners! Fun tour, fun block (thanks) and really fun fabric. Thanks for sharing about your hometown and love your new line. LOVE your new line of fabric....such modern shapes and colors! Thank you for the chance to win!! I can't imagine our mayor dressed like Leslie! I've visited Austin once and thought it was great. Thanks! HELLO! 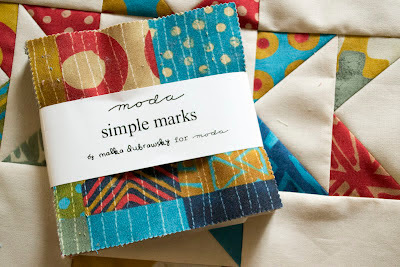 LOVE YOUR BLOCK OF SIMPLE MARKS! THANKS FOR SHARING! That guy made me laugh...a great start to my day! Your new fabric looks fresh and fun and I love the colors! Thank you for the chance to win! You are so lucky to have QuiltCon in your city! I hope that I make it out there for that event! Can't wait to see the new collection in stores! Simple marks is stunning--great colorwaY!! Thanks for sharing. I'm still working on my stitch in color quilt and now a new line! Can't wait! Thank you for the tour of Austin! I think we lost a lot of people here in Utah to you when the Samsung manufacturing plant opened up. Austin sounds like a fun place! I have a good collection of your last print line and am just waiting for our rains to come so I can get to work on it - a great winter project because the colors are so bright and cheerful. thanks for the opportunity to win some of your new line. Hope to visit Austin, my nephew and his wife just moved there and they love it. This blog hop has been so fun to learn about so many different cities and towns! Thanks for sharing yours! i love your new line...esp. the + marks...and your colors are fantastic. :) thanks for the chance to win. I love Austin. Spent lots of time in and around there as a youngster...lots of Dad's kin in that neck of Texas. But, I was born in CA, and live there now in Fair Oaks, near the capital of Sacramento. Tex mex was my favorite thing when i lived in Texas (real Tex mex)! Love the new fabric. Hello from Granbury, TX! I must admit I love Austin too. If I could talk my husband into moving there, I'd be there in a heartbeat. I'm not too thrilled with the look of your mayor. He has TMSS = too much skin showing. I hope you have fun with your new line of fabric. I love the colors you chose. Thanks! What a beautiful new line of fabric! Thanks for the give-a-way! I love Austin where my parents used to live -- lucky you! What, no mention of UT? Nice fabric. On the other hand, THIS time I WILL be hunting down fabric stores. Help a sister out! I love the autumny colors of the new line! thanks for the sneak peek! I have never been to Austin, only Houston, but I am a big music fan and can only imagine how much fun it is to live there. Love your fabric! LOVE the new colors! They are right up my alley as fall colors are my favorites! Hope I win! This guy is hilarious! Thanks for sharing your hometown. Your new fabrics are gorgeous! Also, I love your supersize Shoofly pattern in American Patchwork and Quilting. Am making it for my nephew for a wedding gift, and it's looking great. Thanks for the chance to win. That mayoral candidate reminded me of our former governor here in Minnesota (Jesse Ventura, the former wrestler)! Hey, we are practically neighbors! I live just down I35 in Kyle. You protrayed Austin just right...it is an awesome city. Such a cute new fabric line. Thanks for the chance to win. Love your fabric...and your tour of Austin. Yeah Quiltcon...I'm coming!! Can you tell I'm excited. Thanks for the giveaway. I love your fabrics!!! The color and the prints are gorgeous!!! Please pick me, I don't want to wait until November for your fabrics!!! Thank You for the pattern!!! I love, love, love A Stitch in Color, so I'm really excited to see your new line! so excited to attend Quilt Con! should be amazing. also excited for the peek at the new collection - love it! Your new fabrics are beautiful! Thanks for the giveaway. Thanks for sharing your highlights of Austin and I loved the peek at the new line. I'd love to visit Austin! I have only barely left New England. Nice refreshing colors! thanks for chance! I love the colors in your line. Well you certainly have a colorful town, no wonder your line of fabric is so colorful :D. I live in Augusta, GA which is a good place to live if you love golf. I'd rather be quilting! It has been really fun getting to know everyone. Thanks! :) Thanks for the chance to win!! Your new line looks great! My hometown is a little town in Southern CA, Bellflower. It was a GREAT place to grow up in the 50's and 60's, but you wouldn't want to live there now. Sad. It was a Dutch dairy community. The saying was, "no flower like Bellflower" because of the distinct dairy smell. Main street going through town, the Woolworth's lunch bar, so many wonderful memories. Such a fun peek! I need to use my stitch in color! I have lived near Austin for a couple of years and I think you are so right. I loved it. And the new fabric is wonderful! Enjoying this blog hop very much....love tex-mex food too....I have never been to Austin! Looking forward to your new fabric line. Thanks for the giveaway. Visited Austin a few times for work and loved it! Love the look of your new line! Thanks for a chance to win some. Thanks for previewing the new fabric line. Looks like a lot of fun! Your color combos are awesome! I'll be looking for it in the stores and online. Thanks for the your of Austin. I love the mix of colors in your fabric line! thanks for chance to win charm pack. Oh Wow! When I saw Leslie, I knew where you lived right away. We retired from Austin and moved to Elgin in 2000.....small world. Love your fabric line and thanks for the PDF file. I love stars. Oh how I miss Austin. I lived there during my college years but now live close to Ft Worth in Godley, Texas. I loved living in Austin and enjoyed ever weird wonderful second of it! Thank you for the chance to win! I love Austin! I live about 5 hours east and just love when I can get there! I'm also going to quiltcon! Yay! Love the colors and patterns of this collection. And the saturated colors are full of energy. Thanks for the chance to win. I'll be waiting for the collection to be out in November!!! I love the new fabric line and thanks for the pattern and chance to win. I love your work. Someday, I will visit Austin..sounds great. I love your fabric! Just this week, we saw a travel channel food show about music and food and your beloved Austin - stellar! I love your block---thanks for the pattern! And your new fabric looks great! I'd love to win a charm pack or packlets!! Love your work. Sounds like I would love Austin too! hneyhcs 90I love all the bright fun colors of both your fabric lines. Can't wait to make a small quilt using this fun pattern you've shared. Thanks!! Love your color combinations and how exciting to have a color line, thanks for the giveaway. I am still cracking up over that man in the speedo! colors in your new line are wonderful! Your new fabric is gorgeous. Love all those bright colours. Wish we had just one Tex-Mex restaurant in my small town. I live in Columbus, Ohio. Love your fabric line and the pattern and especially how you put them together. Thank You, Thank You for designing this line - I have been looking for a certain colour combination and here it is! looking forward to working with it! I love Austin! I'm grew up in Dallas, and always loved to visit Austin when I could. I love your new line, such beautiful colors! I live in Austin too! I love all those things about Austin too. RIP Leslie. He was a nice man. I will add the sunsets over Lady Bird Lake to the list! Someday I would like to visit Austin Texas! Glad to know "Thong Man" will not be roaming the streets when I do get there! I just don't know about the heat factor! We have it pretty nice here in the Pacific NW! Thanks for the lovely pattern and the give away! Love your fabric line! Well, you certainly got my attention with the thong - but being the kind of girl I am I got way more excited about your new fabric line! I LOVE this colors - they are all through my home. I am such a big fan or your fabric and designs - I'd be doing the happy dance if I won! Thanks for the opportunity! Interesting mayor!! Fun post! I think my mayor is boring compared to yours. Woo hoo its great that quiltcon is in Austin! Great list about Austin. I grew up in Austin and my family all still live there. I live in MA now, but there are times when I miss Austin. I would also add to your list Barton Springs. Thanks for the giveaway. Your new line is beautiful. I've always wanted to visit Austin! Thanks for the fun info!! How fun! I didn't know you lived in Austin - it's on my list of places to visit for sure. I'm loving the new line.. I JUST yesterday cut into my A Stitch in Color stash to make a baby quilt - it was so hard! Your new fabric line looks great! I like those colours. Austin sounds like an interesting place. Thanks for a chance to win some of your new fabric. I am really enjoying reading about everyone's home town...what a fun idea this was! And I love the look of Austin...sounds like there is never a dull moment! Love the bright colors!!! Looks like Austin is a lot of fun, I will have to visit someday. Would love to visit Austin, sounds like a fun town. Thanks for the pattern and I love your new fabric line. So, you are from Austin, Texas and I am from Sonora, CA. We are 2 1/2 hours away from San Francico and we are known as the foothills. Good luck on your new line of fabric, Simply Marks. Looks like a great line of fabric to be arriving at the quilt shops. Thank you for giving all of us a wonderful chance to win those charm packs. 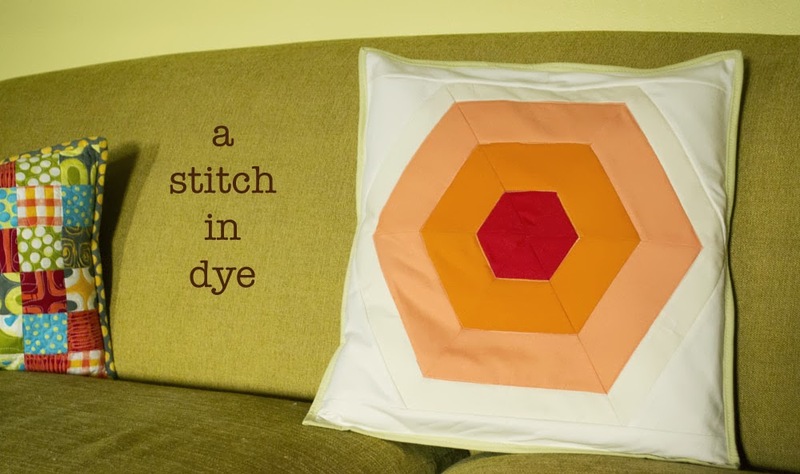 We all need fabric and a little more quilting time in our lives. Wow, your too lucky to live in a place that is hosting Quiltcon! Maybe it is time for me to move. Thanx for the designed fabric. Oh, those little packs of fabric look wonderful and I would love to win!! Has been fun reading about the different home towns of Moda designers. Leslie appears to be quite an interesting character lol. Love the colors of the new line! Wow, I'm excited about your new fabrics. 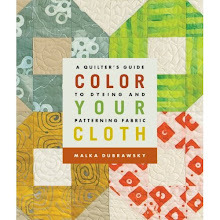 My mom just bought me your fabric dyeing book without knowing that I read your blog and own Fresh Quilting! It would be fun to try out your new line! I live in Williamson County off RR 620 and I love Austin. I am thrilled to be going to the Austin Quilt Show, the Houston Quilt Show and the Modern Quilt Show in Austin in February. I really love living here this year. I love those colors! And I love Austin, too! I had a 3-month gig there last fall, and I was sad to leave it. I love your list. I do miss the great Mexican restaurants in Texas. (I'm originally from Houston.) Your new line is beautiful. Thanks for the giveaway. Your colors and the the print are FANTASTIC,keep up the good work. Love your new fabric. Thanks for the pattern too. oooh, fab! I adored your first line of fabrics & looks like I will adore these as well - yum! oh and I agree, Austin is the best place to live (although I am now 20 miles east of there) but I still do work here! Love it!! Love your new fabric line! Hope I win. Thanks for the chance. I'm in love with the color of your fabric. Thank you for the pattern. I'd love to work with your fabric at this time of year. thanks. I really like that new fabric...I want! Thank you for the chance to win your beautiful fabric. I love the colors and design of your new fabric, I'll look for you on Craftsy. That fabric is so great! thanks for sharing! I am heading to Texas for the 1st time in October... can't wait! What fun fabric! I just love all the pre-cuts that Moda makes! Love the fabrics - very nice for fall! thank you for the chance to win your fabulous goodies!! Love the picture, now that's worth a 1000 words. LOL Thank you for the chance to win some of your fabulous goodies. Loved your last line of fabrics, looks like I will love this new line just as much. Cute block and great fabric! Thanks for the opportunity to win. 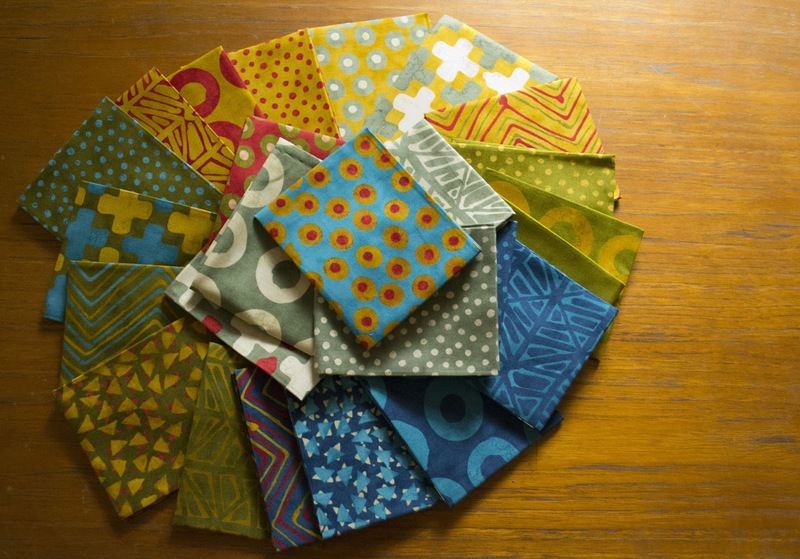 Love the colors of your new line of fabrics, thought 2 1/2" squares were called "candy". No matter what they are called they are cute. All the bloggers have such neat info and love to read about all the hometowns. I take it Leslie never his Mayoral bid? LOL! Your blocks look beautiful. Love the new fabrics! There is always someone in your town that you remember! We have one and he calls himself "Spaghetti Man". Dances away at the free concerts in the park. Love the fabric line. Thanks for the chance to win. Beautiful fabric in both collections...would love to win! Love your colors for the new line. And thanks so much for the pattern! 1. I would totally vote for Leslie if I lived in Austin. 2. Yay! I'm so glad you are coming out with another fabric line. I made a bag out of the cheater cloth from your first line and I love it. I get compliments on it all of the time too. "Simple Marks" the colors go together so beautifully! Thank you for sharing your block and home town news. I looked up your unofficial mayor - what a sad story. I love your preference for Tex-Mex vs. Starbucks - I think I'll start a movement here! Looking forward to your next collection (especially the cheater cloth). I lived in Ft. Worth for 11 years and have been to and through Austin many times - it's a sweet town! I love your modern take on quilting and fabric design. Just one question - what is cheater cloth? I haven't been to Austin or to Quiltcon! So, instead, I'd like to win some fabric please! Thanks for the chance! I can't wait to see your new line in all its glory. Love the colors in your new fabric line! I have been to Austin a few years ago. My son attended A&M and I was house sitting for him while he was on a ski trip. I drove down to Austin and a few other places. It is a nice town! I've enjoyed all your blogs so much...hope I win! Comment on ....I know, LESLIE ! There are NO WORDS, but LOLOL. I live in The Great State of Texas too! Enjoyed your blog. Love the new fabric line, the colors are rich and fun :)Austin sounds like a fun place to live and it has been fun to hear from all the Moda designers and learn about where they live. Yey! A new Malka Dubrawsky line! Your blog made my day--I laughed right out loud. And then I loved seeing your beautiful fabric and block, too. Can't beat that!!! Thank you so much. Can't wait to see your new line of fabrics! they look beautiful! Austin reminds me of my little city Northampton, Mass! Love your new line - bright and cheery colors. Your town sounds like a lot of fun! those teeny bits are adorable. I had heard Austin was a great place, with the river running through it, etc. but now you have me convinced. As for you new fabric line, well, I'm loving that too! Huge congratulations! The first pic of the Mayor was great. He looks like he had quite a sense of humor. It looks really great. I love those blues and oranges. I would love to win some of your yummy fabric! Thanks for the giveaway! Thank you for Sharing. Austin sounds lovely. We're due back in TX in 2013 and will probably be staying for a year to 18 months. I will have to put austin on my list for weekend travels. Fell in love with San Antonio and Fort Worth the last time we were there. Great new collection of fabrics! I think you win for the most colorful Mayor candidate! Austin sounds like a wonderful place to live. Thank you for the block pattern. It looks like a great project. Love your little tour of Austin! Your fabrics really sing and I bet they would fill up a Quilter's Bar in Austin! Take care and thanks for the chance to win! 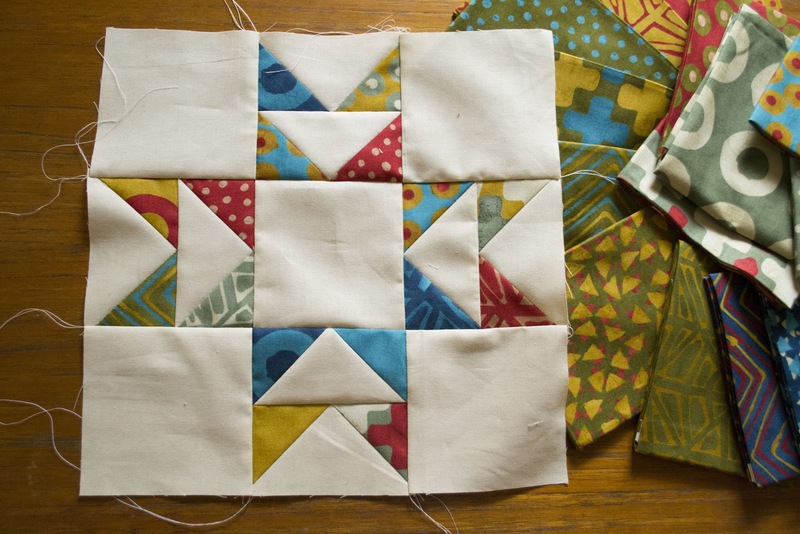 i really like that quilt block and your new line looks fun. love the colors. Thank you for sharing snippets of your town. Love your fabrics and designs. I love those fabrics, and I also enjoyed learning more about Austin! R.I.P. Leslie Cochran, it's always sad when the world loses a character like that. Love your block! Flying geese are my favorite!! Thanks for sharing your hometown story. I love the pattern too. Loved your top five about Austin. I think I will have to visit some day. Thanks for the chance to win such yummy fabric. Wow, life in Austin is certainly colourful. Going to Quiltcon must be fun, I would love the chance to visit something like that. Simple marks is a great range, I think it would appeal to my teenage daughters too which is really saying something. Thank you for the giveaway. Will be great hosting Quiltcon,here is a dream. Beautiful town and pictures.Thanks for sharing!! Thank you for telling us about Austin,Tx. Like your new line of fabric. Thanks for the opportunity to winning them. dwgari 19Will be great hosting Quiltcon,here is a dream. Such pretty and colorful fabric! Thanks for the chance to win! What ... ahem ... colourful characters you have in Austin! More than ever, I think I should visit! Simple Marks is very pretty. Love your new line...loved your previous line so much I made three coordinating quilts from it! I've visited many cities in Texas but have not yet made it to Austin. Maybe some day. I love the Simple Marks colors and patterns! Lovely. Hi I live in Copperas Cove, TX just about an hour north of you:) Love Austin and have family there!!! Thanks for the lovely giveaway. When I think of Austin, I think of Motorola and computer chips. PBS does run features of Austin City Limits too. I LOVE Simple Marks. Wonderful colors!